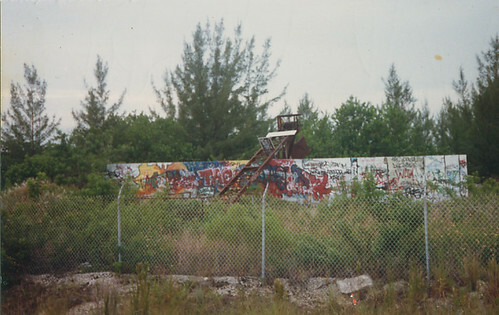 found 4 flicks for term "Ives,Cement,Factory"
Writer: Merry Christmas Miami by Frosty Phrase Hide Ink Essence Crew: OSB TMOD Location: Ives Dairy Cement Factory Date: 1986 Submitter: Miami So Real Comment from Nitro: This production is the last thing that ever ran on that wall before it got torn down. This cat Newwave (USC) and I went out to that wall while they were finishing it. There were a lot of fights over that wall and the local cats (us) kept pretty tight tabs on it. The people I saw there that day were Frosty, Hyde/Hide(TMOD), this kid Frankie that used to hang out with TFF(TOG) & TCB, and Sen TFF. Apparently Essence (this cat John, who didn't get up all that much) was out there because he tagged it, and that kid Ink. Oh yeah, Frosty's dad was there too. But HYDE deserves many props for that wall because he is the only guy that was painting that clean back then. No one was really digging Frosty way back because he only did legals, but recalling the local lack of love for Frosty I have to say he still got props for the 1 Step Beyond piece and it ran forever.